In-the-bag implantation of intraocular lens (IOL) is the basic standard of care in cataract surgery. In aphakia with good capsular support, three-piece ciliary sulcus placed IOL is the best option. In cases such as complicated cataract surgery with inadequate capsular support, traumatic dislocation of lens, subluxation of lens as in Marfan syndrome, and aphakia following congenital cataract surgery, the various surgical options available to correct aphakia are anterior chamber IOL (ACIOL), iris-claw anterior and posterior IOL, scleral fixated IOL (SFIOL), and more recently, glued IOL. In this study, the effectiveness, safety, and complications related to posterior iris-claw implantation are evaluated. Dr. Cornelius Binkhorst first introduced four-loop and later modified to two-loop iris-supported IOLs in an intact posterior capsule also called iridocapsular IOLs to overcome the disadvantages of dislocation of Ridley's posterior chamber lens and increased risk of corneal decompensation in ACIOLs. Later, Professor Jan Worst attempted to improve the stability of IOL without interfering with pupillary dilatation and introduced the modern design of iris-claw IOLs in 1972. 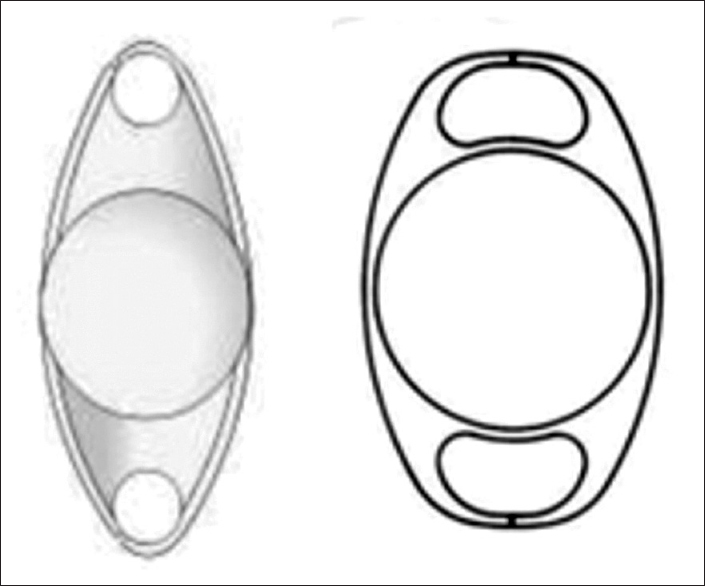 In 1997, it was further modified from a circular haptic to a more oval and larger haptic to aid in easy enclavation to iris tissue [Figure 1]. ACIOLs in spite of easy surgical procedure have the risk of increased corneal endothelial loss which can lead to decompensation, raised IOP causing secondary glaucoma, iris chafing, and poor pupillary dilatation if requires a retinal evaluation and procedures at later date. SFIOLs though closely resemble the anatomical position of the lens has a steep learning curve and a long surgical procedure considered a major disadvantage among the fast-paced surgeons of today. Sutures tied to sclera can cause tilting of the lens leading to blinding astigmatism or sutures degenerate in long-term leading to decentration or dislocation of the IOL into the vitreous cavity.,, Sutures can also erode the conjunctiva and become exposed causing irritation and granuloma formation. Posterior iris-claw IOLs have less risk of corneal endothelial damage and secondary glaucoma than ACIOLs, clipped to the immobile midperiphery portion of iris can achieve good pupillary dilation, less risk of tilting of IOL causing astigmatism though this can occur when equal enclavation is not done, and less inflammation in the hands of skilled surgeons. The greater advantage is the centration and stability of the IOL [Figure 2]. A prospective interventional study was done on 100 eyes of 99 patients from July 2013 to June 2017 at Regional Institute of Ophthalmology Government Ophthalmic Hospital, Chennai. Aphakia due to complicated cataract surgery and subluxated and dislocated lens. Preoperative evaluations included BCVA, intraocular pressure measurement using Goldmann applanation tonometry, thorough slit-lamp examination of cornea and iris tissue, posterior segment evaluation using +90D biomicroscopy and indirect ophthalmoscopy with +20D, and keratometry, and A-scan reading was measured to calculate the IOL power with 117.2 as the A constant (Optima ®) using SRK II formula. In pediatric cases, optic size of 4.5 mm was used. Postoperative examinations were done on the 1st day, 1st week, 6th week, 3rd month, and later individualized to patient's condition. Under peribulbar anesthesia, sclerocorneal tunnel of 5.5 mm was made, and two side ports at 3'O and 9'O CP were made. A thorough anterior vitrectomy was done using a mechanical vitrector. About 0.5% pilocarpine was injected intracamerally for a good pupillary constriction which aids in good centration of IOL. Posterior iris-claw IOL was introduced into the anterior chamber using iris-claw holding forceps and one of the haptics is brought behind the iris and enclaved using a blunt-tipped instrument taking care avoiding too much pressure. Similarly, the second haptic is brought under iris and enclaved. The IOL is gently tapped at the center to ensure its clipping and a slight dimple is confirmed at the iris midperiphery. Scleral wound was closed with 10–0 silk suture. In case of dislocated lens, pars plana vitrectomy and lens removal were combined. Postoperative BCVA using Snellen chart and signs of inflammation (cells, flare, and pigment dispersion) were noted on slit-lamp examination. During the follow-up period, patients were examined for decentration and dislocation of IOL, iridocyclitis, cystoid macular edema, vitritis, and retinal detachment. One-hundred eyes of 99 patients were included in the study. Four eyes were in the age group of 0–10 years, of which 2 eyes had subluxated natural lens and 2 eyes were aphakic following congenital cataract surgery; Three eyes between 31 and 40 years; 31 eyes between 41 and 50 years; 34 eyes between 51 and 60 years; and 22 eyes between 61 and 70 years. 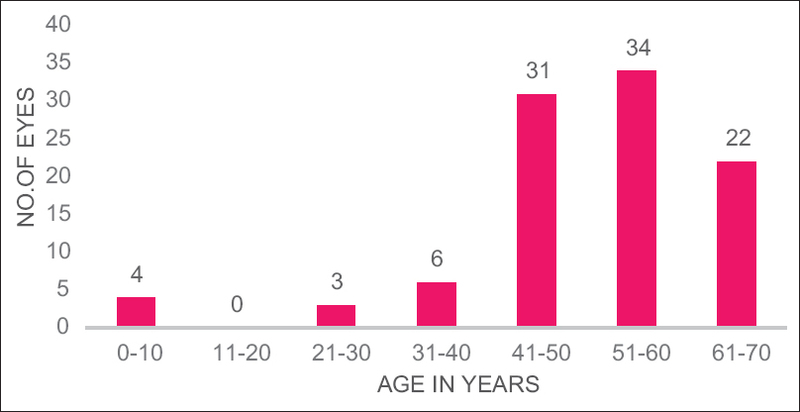 The mean age of patients was 50.5 years (5–68 years) [Figure 3]. 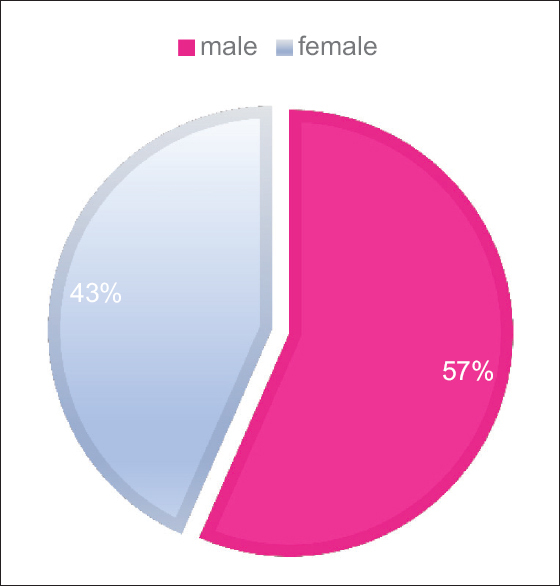 Of the 99 patients, 56 (56.6%) were male and 43 (43.4%) were female. 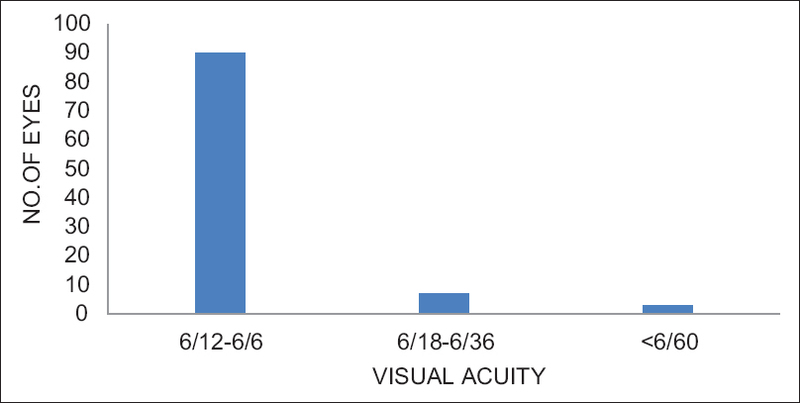 The increase in frequency among males was attributed to the common occurrence of trauma among males causing subluxated or dislocated lens or IOL [Figure 4]. 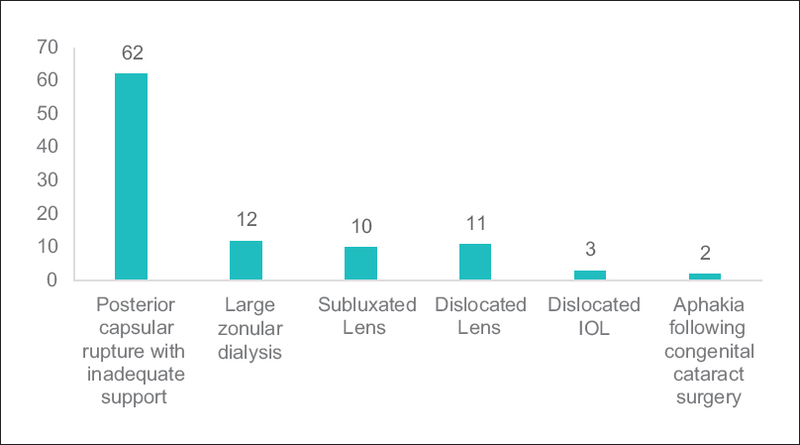 Various indications for surgery were posterior capsular rupture with inadequate posterior capsule in 62%, large zonular dialysis in 12%, subluxated lens in 10%, dislocated lens in 11%, dislocated IOL in 3%, and aphakia following congenital cataract surgery in 2% [Table 1] and [Figure 5]. There were no preoperative complications. IOL was well centered in all patients. Of the 100 eyes, 90 eyes had a BCVA of 6/12–6/6, 7 eyes had BCVA 6/18–6/36, and 3 eyes had BCVA of <6/60 at 6-week postoperative period. 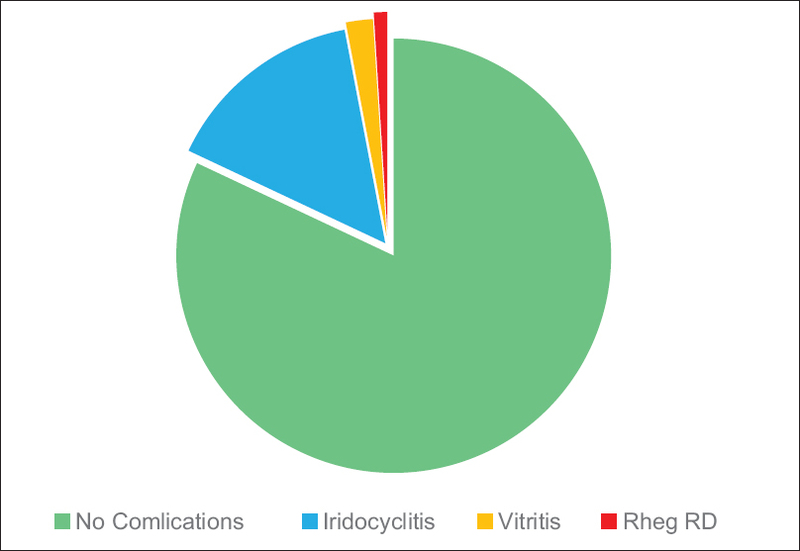 Of the 3 patients with <6/60 BCVA, 2 developed vitritis and 1 patient developed rhegmatogenous retinal detachment. None of the patients developed cystoid macular edema, subluxation, or dislocation of IOL during the follow-up period [Figure 6]. During the follow-up period, 15% developed iridocyclitis and responded well to topical corticosteroids and cycloplegics, 2% developed vitritis and were treated with periocular steroid, and 1% developed rhegmatogenous retinal detachment who underwent scleral buckling surgery [Figure 7]. Aphakia is no more an option in the armamentarium of ophthalmic practice. Spectacle aberration of aphakic glasses and demanding manual dexterity of contact lenses have been superseded with surgical correction of aphakia. The various methods of surgical correction of aphakia are ACIOLs, SFIOLs, and anterior and posterior iris-claw IOLs. This study emphasizes on the safety and effectiveness of posterior iris-claw IOLs in the management of aphakia with its advantages of having speedy learning curve, well-centered IOL, and less chances of corneal–endothelial damage or intraocular pressure rise. In the study, 90% of patients had a visual improvement >6/12 which is comparable to the results of Gonnermann et al. study group. In this study, 15% developed iridocyclitis on the 1st day of surgery and responded well to topical steroids along with cycloplegia. Two percent developed vitritis during the follow-up period and were treated with periocular steroids and 1% developed a rhegmatogenous retinal detachment and underwent external scleral buckling. Gonnermann et al. also studied the frequency of complications and found them relatively low compared to other options available for surgical aphakic correction. No eyes had clinically significant pigment dispersion, cystoid macular edema, secondary glaucoma, subluxation, or dislocation of IOL. SFIOL polypropylene sutures degrade over time causing dislocation or subluxation of IOL requiring a repeat surgery. Studies have shown the rate of suture degradation between 7.8% and 27.9%. Posterior iris-claw IOL fills this vacuum and is a better option while considering for the pediatric age group, thus providing a long-term benefit. In this study, two eyes with ectopia lentis in the pediatric age group were included with improvement in postoperative visual outcome and the results were comparable to that of Cleary et al's. study. The benefit–cost ratio is higher compared to glued IOLs and can be taken as a preferred choice in our developing nation. Posterior iris-claw implantation can be performed less invasively within a short surgical duration with an excellent visual outcome in patients undergoing pars plana vitrectomy following lens dislocation or IOL dislocation into the vitreous cavity. As a serendipitous invention by Binkhorst and later modified by Worst following keen observation and experience, posterior iris-claw IOLs having stood the test of time has been serving as a safe, effective, timeless as well as a timely option in the surgical correction of aphakia. Bading G, Hillenkamp J, Sachs HG, Gabel VP, Framme C. Long-term safety and functional outcome of combined pars plana vitrectomy and scleral-fixated sutured posterior chamber lens implantation. Am J Ophthalmol 2007;144:371-7. Price MO, Price FW Jr., Werner L, Berlie C, Mamalis N. Late dislocation of scleral-sutured posterior chamber intraocular lenses. J Cataract Refract Surg 2005;31:1320-6. Assia EI, Nemet A, Sachs D. Bilateral spontaneous subluxation of scleral-fixated intraocular lenses. J Cataract Refract Surg 2002;28:2214-6. Mohr A, Hengerer F, Eckardt C. Retropupillary fixation of the iris claw lens in aphakia 1 year outcome of a new implantation techniques. Ophthalmologe 2002;99:580-3. Huang YS, Xie LX, Wu XM, Han DS. Long-term follow-up of flexible open-loop anterior chamber intraocular lenses implantation. Zhonghua Yan Ke Za Zhi 2006;42:391-5. Numa A, Nakamura J, Takashima M, Kani K. Long-term corneal endothelial changes after intraocular lens implantation. Anterior vs. posterior chamber lenses. Jpn J Ophthalmol 1993;37:78-87. Asadi R, Kheirkhah A. 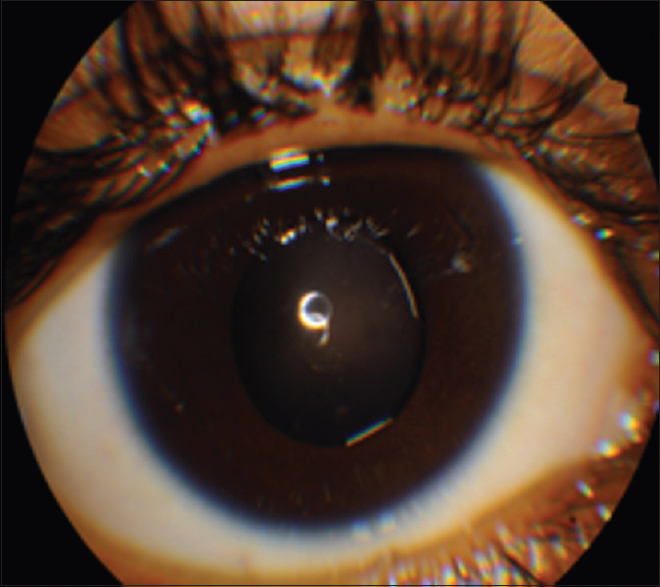 Long-term results of scleral fixation of posterior chamber intraocular lenses in children. Ophthalmology 2008;115:67-72. Cleary C, Lanigan B, O'Keeffe M. Artisan iris-claw lenses for the correction of aphakia in children following lensectomy for ectopia lentis. Br J Ophthalmol 2012;96:419-21. Farrahi F, Feghhi M, Haghi F, Kasiri A, Afkari A, Latifi M, et al. Iris claw versus scleral fixation intraocular lens implantation during pars plana vitrectomy. J Ophthalmic Vis Res 2012;7:118-24.